A fire on a so-called "ghost ship" on Teesside should serve as a warning of a potential toxic incident, environmental campaigners have said. 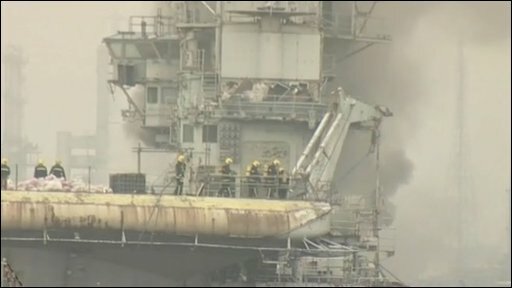 Up to 50 firefighters battled flames on the former French aircraft carrier Clemenceau near Hartlepool on Friday. Able UK, which is dismantling the 32,700-tonne ship, said the fire posed no public risk and was not near to any of the asbestos it contains. The Friends of Hartlepool group say the vessel was a health hazard. The Clemenceau, which arrived at the firm's Graythorp dry dock a year ago, was turned away by India and Egypt for being too toxic to be broken up. Campaigner Jean Kennedy said the ship was "full of toxins" and that it was a "travesty" that the ship had been allowed to be dismantled at the yard. She said: "I have no trust what so ever in this being done properly. "Even at this stage we have seen the dangers it has brought to this town. "I am absolutely disgusted because there are schools nearby and the firefighters could have been facing toxic fumes." Cleveland Fire Brigade said the fire, which was contained within three compartments, started in cabling. 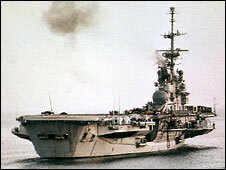 About 70 people had been working on the ship when the alarm was raised at 0910 GMT but there were no reported injuries. Fire crews took more than an hour to bring the flames under control. Neil Etherington, development director of Able UK, said well-rehearsed emergency procedures had worked well. He said: "The situation was dealt with by the fire service in a relatively straightforward and routine manner. "There were never any dangers to the public and there was no injuries to staff on site. "There was no hazardous materials involved, no asbestos was anywhere near the fire." He said an investigation into the cause was under way. A skeleton staff is to return to work on Saturday and normal shifts are expected to resume on Monday. The project to dismantle the Clemenceau is one of the largest of its kind in Europe. About 70% of the total asbestos-containing material has so far been removed and the firm expects to complete the operation by April. The total dismantling of the hull is predicted to be completed by the summer.